Our neighbor gifted us with this gorgeous bunch of morel mushrooms. Seems everbody’s got their own way of preparing them. I soaked them in salt water, rinsed and picked through them, cut them in half then coated them in flour. Then dipped into egg and finally Italian breadcrumbs. A quick fry in some oil and we were good to go. Okay, enough of the bad mushroom rap. 5 Responses to D. t'the E.
I’m so jealous! I’ve been having major Dairy Queen cravings today, but I think you changed my mind. But the chances of my neighbor showing up with those beauties is slim to none. Well actually just none. Guess I had better stick to DQ. yum, mushroom season came and went twice around here. i didn’t get a single one. i did get an envious ear full of many mushroom stories though. 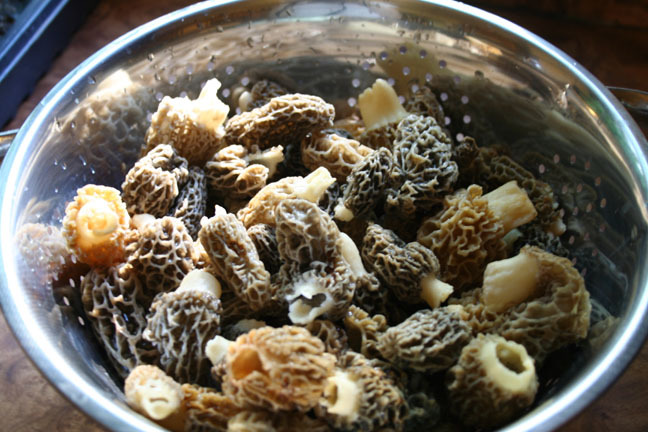 When I saw your collander of morels, I could immediately smell them frying in butter in my Grandpa’s kitchen in Greeley, IA. That was going on 2 decades ago. Dredge in flour, fry in butter. Yum. haymaker – that’s exactly the way my mom fixes them. Not sure why I did it the way I did (maybe cuz that’s how I fry chicken? ), but they turned out yummy. But flour & butter would have been a lot faster and less messy!